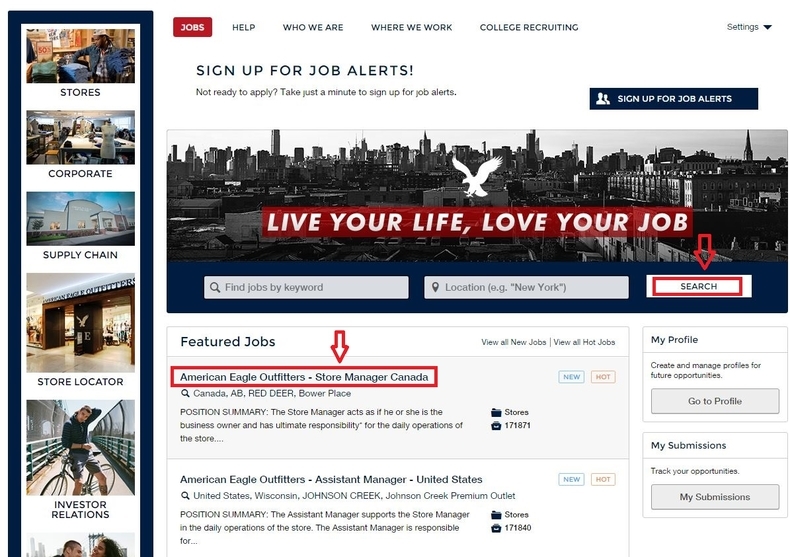 Go to liveyourlifeloveyourjob.com and you will be rendered two methods of searching for job openings at American Eagle Outfitters. You can type in the key words or location and click the button "Search" to find job vacancies at present. After that, you will be presented a "search results" page on which all current jobs are listed. 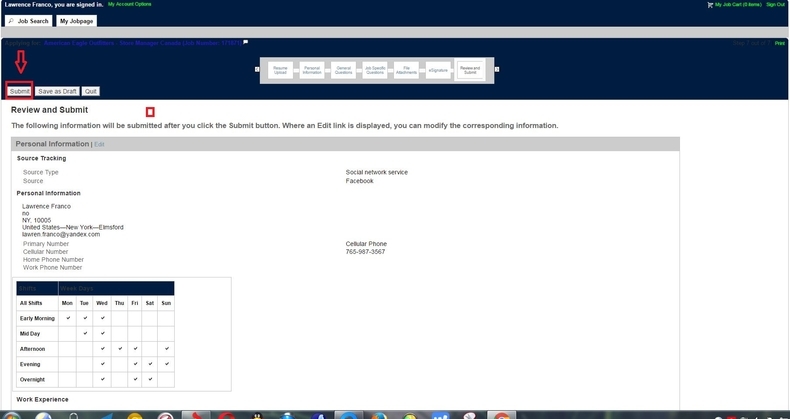 Select a position in accordance with your situations by clicking the job title directly. Or you can simply choose a position from the list of featured jobs on the careers page. Here the latter one is chosen as an example. After you click the job title, a job description page will pop up, on which position summary, requirements, skills and qualifications are listed. 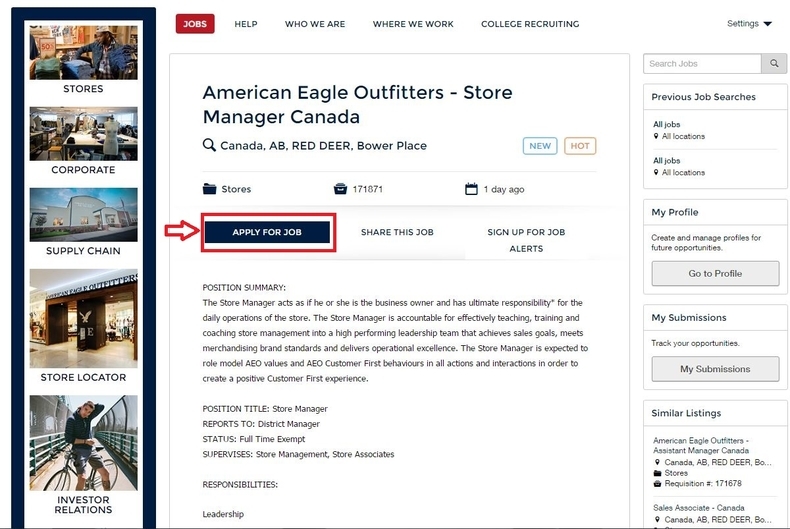 Browse this page carefully and click "APPLY FOR JOB" if you do decided to apply for this position, then there will appear a small window requiring you to provide your email address and name. Fill out the required information and click "Save and Continue" to move on. You are required to register a new user account to further the online application. 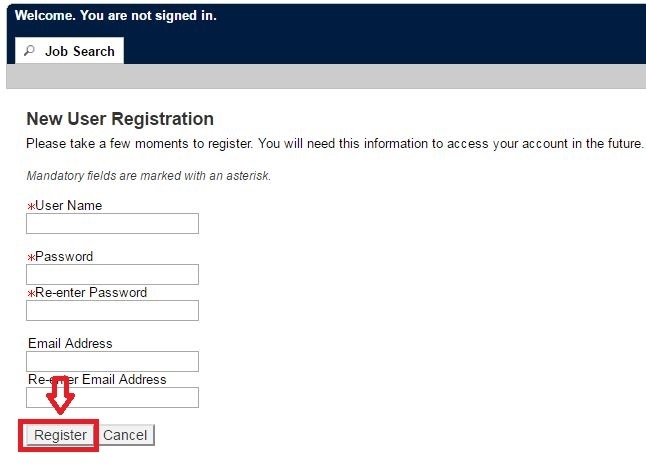 Enter the user name and password and click "Register" to get your registration done. After that, you will go to a new page which demands you to enter a security question and answer since you may possibly forget the user name and password. Then you will be given a privacy agreement page, read it and click the button "I Accept" to continue. One current resume should be uploaded in this step. Choose the profile from your computer and click "Save AND continue" to go to the next step. Here you need to fill out your personal information as required. All demanded fields are marked with asterisk. The source type, name, address, city, zip code, place of residency, primary number, email address, shift availability grid, work experience, education and basic profile information are included. Here are four questions to be answered, such as "Have you ever worked in American Eagle Outfitters before ?" and "Are you legally eligible to work in Canada?". After selecting your answers from each selection bar, you can click "Save and Continue" to go to the next step. You need to provide your answers for the ten job specific questions in this step to make your application profile more intact. 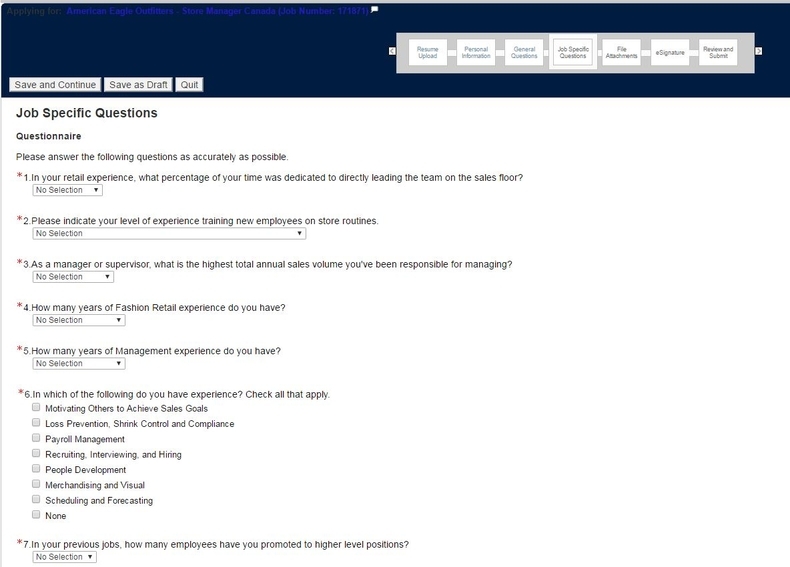 Select your answer from the selection bar and continue your online application by clicking the button "Save and Continue" at the bottom of this page. 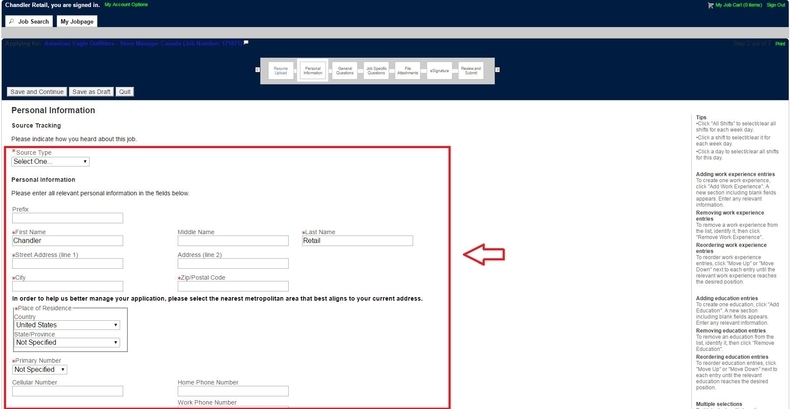 Choose profiles that you think important from your computer and click "Attach" at first and then click "Save and Continue" to go forward. Read the statement on this page before typing your full name in the required box. Click the button "Save and Continue" to move on to the ninth step. You will go to a review page on which all Information you've provided are shown. Check this page and click "Submit" to get your online application done, after which you will be given a "Thank You" page proving that you have completed your application. 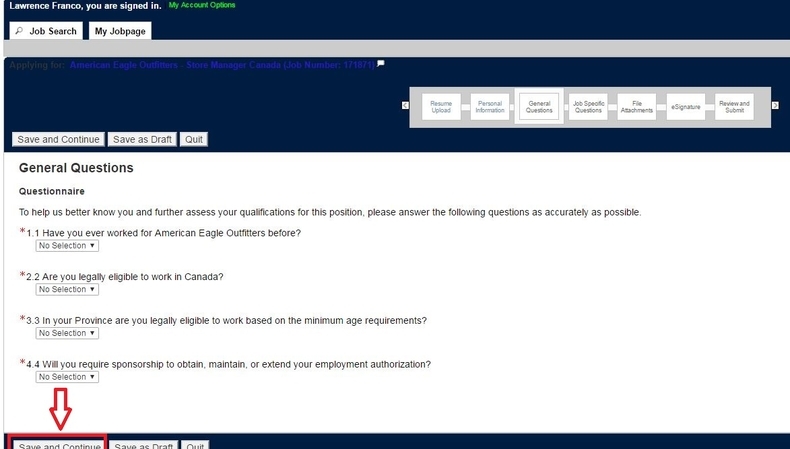 Click aeo.jobs to apply for American Eagle Outfitters jobs online.